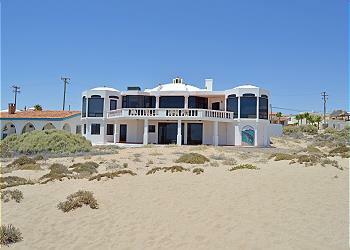 This beachfront home has three bedrooms, and two baths. The master suite has a king bed and private bath. Anotherbedroom has a queen bed, and the third has 2 twin beds. In the kitchen/dining area there is a wood-burning fireplace (bring own wood or firelogs) and a large dining table. The kitchen is fully equipped with a coffee maker, blender, microwave, and toaster. The family room has another fireplace and game table. Amenities include Satellite TV, ceiling fans, window A/C units, a large ocean side patio with furniture, gas barbecue, . Sheets and towels provided. Owner requests No Smoking Inside and No Pets. 2-night Minimum during the week; 3-night minimum during weekends in March, April, May, June and October and all Holidays.